Mina Markovič: Winner of Arco Rock Legend AWARD! Winner of Arco Rock Legend AWARD! Arco rock legends awards are kind of highest international awards in climbing, assigns two prestigious sport climbing prizes. 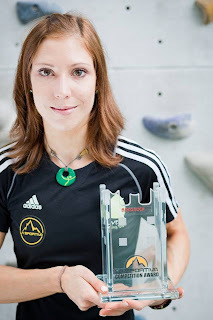 One for climbs outdoors - the Salewa Rock Award and another one for competitions - the La Sportiva Competition Award. They are selected by 12 jurors, representers of 12 international climbing/outdoor magazines.